Ready Shutters offers quality vinyl exterior shutters. Shaker, board-and-batten, raised panel, and louvered shutters will add depth and detail to the exterior of any house or home window. Combo exterior shutters incorporate louvers, raised panel, and/or shakers in a single outdoor shutter panel. Vinyl exterior shutters are offered in multiple configurations (including arched top), sizes and colors. Fixed louvered exterior shutters are constructed as either single-wide or double-wide panels in one or two colors with several divider rail options. Louvered shutters are also sold as decorative arch top shutter panels. Outside synthetic raised panel vinyl shutters are also available in multiple styles, sizes, colors and profiles. Board and batten shutters use horizontal and vertical vinyl pieces for a wood plank appearance. Outdoor shaker shutters are made with the appearance of wider plantation louvers. All vinyl exterior shutters are durable with an extensive warranty. All panels are made in America and ship quickly anywhere in the United States. Most shutters styles are constructed from multi-piece vinyl components. Synthetic decorative custom exterior shutters are inexpensive and affordable and are easily installed on the house with spike or screw hardware. Prices can be obtained quickly by entering the specifications on the page that highlights either the louvered, shaker, board-and-batten, raised panel, or combination exterior shutter styles. Outdoor windows can benefit significantly with the addition of durable custom vinyl exterior shutters, which are built to last the lifetime of your home. Outdoor do-it-yourself shutters are often referred to as synthetic, poly, plastic, faux, composite, vinyl, or PVC exterior shutters. Ready Shutters has a greater selection than can be found in hardware stores, lumberyards, or even big box outlets. We make each order to the color, size, style, and configuration specified. Other retail shops can only stock a limited selection, which probably do not meet the requirements for your house. Windows are available in hundreds of sizes and properly sizes shutters should be selected and installed to match those dimensions. Homes are regularly painted to present a unique, original, distinguishing exterior. Colors should be chosen from a large selection of colors, not just from the few available on a shelf. 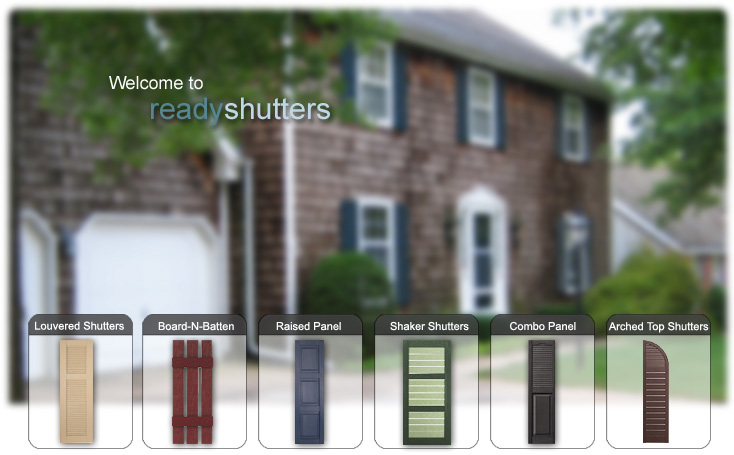 Order shutters online from Ready Shutters to get just what your house needs. © Copyright OP Design, Inc. - All Rights Reserved.